Have you ever really planned a funeral service event? Sure, the flowers are set up, the urn is in place, the seats are reserved, and staff knows exactly what to do and when to facilitate a flawless service. But all too often, the actual ceremony, the most meaningful part and the invaluable marketing tool telling everyone in the audience what you do matters, is left in the hands of the family. For most of us, consulting with families is a mixture of how the person we interned under did it, mixed with a lot of trial and error. Though we want to serve well, we default to an "Every family, every option, every time" approach giving the family our entire set of resources, in hopes that they will choose well. But to your client, it means "I’m unwilling to get to know you, so I’m dumping my entire bag of tricks on the table, and hopefully you can pick what you want." Beyond legal and financial matters, they have five basic choices to make in their time with you, their trusted guide: 1) having a viewing, 2) type of remembrance event, 3) a final resting place for their loved one’s remains, 4) an appropriate container for saying “good-bye”, and 5) an appropriate urn and/or keepsakes. As a profession, we have a tendency to either (a) make assumptions and not educate families well or (b) to overwhelm them with options. Instead, we must become expert consultants, asking the right questions and making meaningful recommendations. What are the special things you hope friends and family members will remember most about your brother? Who were some of your son’s closest friends? What were those relationships like? How did they spend their time together? When your grandmother found time to relax, what would she do? Being a good interviewer hinges upon your ability to be a good listener. Fight the tendency to tell your own stories in response to what the family is sharing and focus only on the family at that time – set aside the to-do list and listen. These answers allow us to guide families on the choices they need to make – your suggestions give them permission to be creative. Be willing to take the remembrance event outside your facility or bring the essence of a unique location inside because your recommendations should flow into the event experience itself. Consider the stadium, the beach, the driving range, and other outside-the-funeral-home-box places. By focusing on asking the right questions and honing our creative event planning skills, you can ensure that each family’s experience is the best possible and that, ceremony or not, the outcome is an experience that you can be proud of having provided. With thanks to Justin Baxley, Senior Vice President of Business Development for Foundation Partners Group, for sharing his passion and professional expertise. 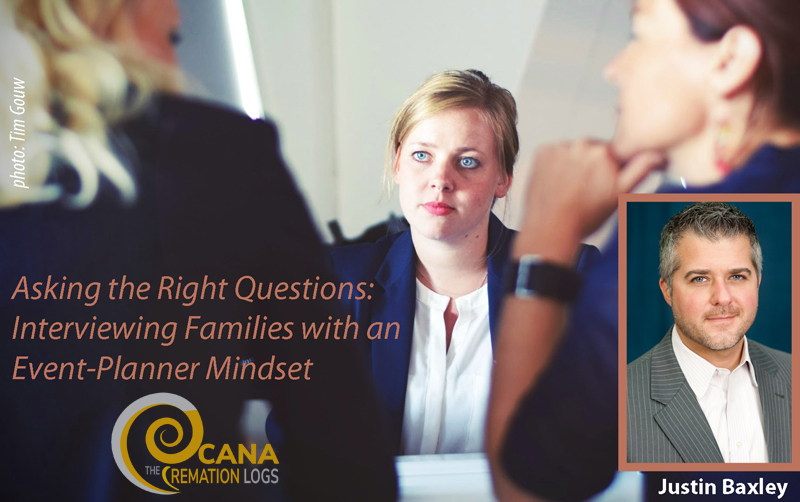 For more information, take CANA’s new Cremation Arrangement Conference online class get more tips for talking to families. Members can read more techniques in Vol. 53, No. 2 Issue of The Cremationist.